Aquaculture has major prospects for providing high quality, palatable protein for people. Compared to other animals, the conversion of plants into animal protein in fish, shellfish and crustaceans is very efficient: the ratio of input food to output is less than 2:1 (typically 1.6 to 1.8:1), compared to 2.5 to 3:1 for pigs and poultry, and 5 to 10 or more for cattle. This is most likely because fish and shellfish are cold-blooded and hence do not need to expend energy on keeping warm. Fish and shellfish farming has a long history – fish ponds are ubiquitous in mediaeval buildings, and gardeners in older houses in the UK continuously dig through ancient shells – but has declined since. Now, fish farming or heavily managed fisheries are having a upsurge worldwide. 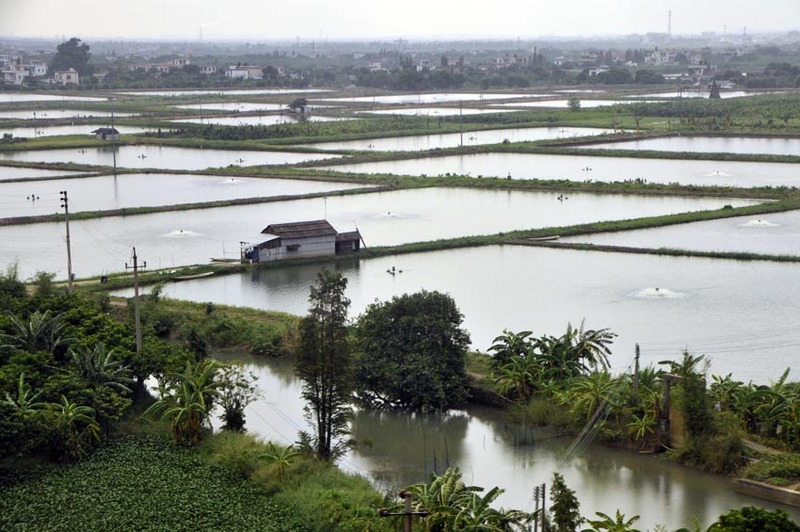 The picture shows expanding fish farms in China along the Pearl River in Guangzhou, while the video below shows managed fishing of tilapia in Lake Hawassa, Ethiopia. FAO has now asked for comments on a consultation document from a “High Level Panel of Experts” on Fisheries and Aquaculture. The draft version 0 is at: HLPE-Fisheries_and_Aquaculture_Draft-V0_18-Nov-2013 locally, or from FAO at this link. 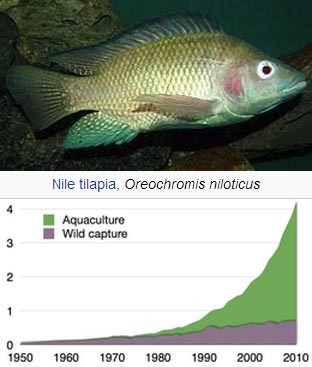 The huge increase in farming of just one species, Tilapia, is illustrated in the report (right). Of course, aquaculture is not the only source of enhanced protein: many ways to process proteins (and particularly soybean) are possible. There has been some discussion on the web about insects as food. Insects have a long history as both domesticated and co-domesticated species, in both cases dating back to the start of agriculture 10,000 years ago. The genomes of honeybees and silkworms show selective sweeps have occurred during domestication, and the cultivated species are substantially different from their wild relatives. Hundreds of insect pest species of animals, plants and human habitations have undergone strong selection too. I am a geneticist with interests including improvement of agricultural species, food security and environmental sustainability. There are many important issues addressed in this document; as is stated, despite aquaculture having a 2,500 year history, modern research has been surprisingly limited. As an overall comment, I felt that many of key statements in the report were unreferenced or referenced to weak and discursive reports rather than rigorous factual studies. This suggests a need for study, and at a number of points in the report, there should be a recommendation of research that is required. I thought that the references and discussion of the importance of fish genetics was considerably under-represented in the report. Genetics could well have its own complete section, not just a subsection of 3.4. With respect to recommendation 12 of p. 81 line 39, can there be some precise consideration of the genetic features being looked for in species used for aquaculture? Disease again is mentioned, but the epidemiology of fish diseases, as well as their nature and control options, should be looked at in more detail, particularly in relationship to prophylatic controls (antibiotics etc) and having in place control measures and associated legistation. There is an excellent consideration of the feeds used for fish from page 47. However, there is surprisingly limited consideration of the future feeds, where it is essential to change to more plant-based products. What is required? Why are current plant meals not universal? Will land-based crops or algal foods be more important? What should plant breeders be looking for in producing fish feed? I felt a few points were underdiscssed at other points: food safety issues may be greater with fish, despite the number of preservation of approaches – drying, salting, cold-chain, processed … Can reduce post-consumer waste – bones and offal used more efficiently (‘co-products) and not discarded? Where is the profit and added value here? There is an excellent consideration of feed conversion figures – but I expect the pork figure has improved considerably since 1999. The report states “Fish oil, which cannot be readily replaced, is expected to continue to slowly increase”: to me, this sounds rather like comments on whale oil 30 years ago. Both plant breeding and plant-oil processing can easily replace in a decadal timescale. I think the report should include chapters on footprinting of various aquaculture systems: it is important to have both a carbon footprint and a water footprint for aquaculture, carried out in a rigorous and defendable way (unlike, say, the rediculous water ‘use’ figures for beef production which are widely cited). There could be a SWAT analysis of several areas: genetics, preservation, genetic resources, nutrition inputs and outputs. While the statements about little work on fish are in general true, it is by no means only the case: there are huge parallels with plant domestication, and already there are large genomics projects (stickleback; danio). The genomics revolution can quickly influence fish breeding, and the Canadian Salmon genomic DNA sequence is soon to be published, while that of tilapia is also nearly available. Genetics will be much quicker using these resources, and it should be noted somewhere that already, transgenic fish are already available for purchase, the only animal and vertebrate in this category (albeit for the tropical fish hobbyist). The report is very valuable in emphasizing the importance and growth in aquaculture, and its contribution to both food security and human nutrition, and I hope will lead to increased amounts of appropriate research and the applications of that research. This entry was posted in Environment, Farming, Farming, Sustainability and tagged aquaculture, clams, consultation, crustaceans, development, environment, FAO, farming, FISH, oysters, prawns, shellfish. Bookmark the permalink.